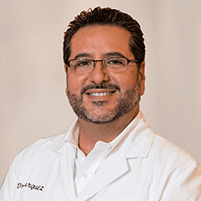 Dr. Burquez is skilled in helping patients restore damaged teeth and replace missing teeth with dental implants, bridges and crowns, so men and women from Chula Vista and Bonita, CA, and throughout the surrounding areas can feel better about the way they look and about the way their mouth functions. Dental implants are artificial teeth used to replace one or more teeth you've lost due to decay, trauma or other issues. They can also be used to secure dentures that otherwise may not fit well. They're called implants because unlike dentures and bridges that rest on top of the gums, dental implants use a metal post or “root” that is implanted into the jaw bone. Implants are a very popular alternative to dentures and bridges because they feel and “work” just a like a natural tooth, and as a result, many people feel more comfortable and confident with implants. Implants require about three visits. During the first visit, the post is implanted into your jaw and allowed to fuse with the bone for several weeks before the second visit. At the next visit, a metal piece called an abutment is attached and an impression is taken to act as the mold for your artificial tooth. During the third visit, the artificial tooth, or crown, is attached to the abutment and buffed for the perfect fit. “Crown” can refer to the artificial teeth used in implants and bridges, and it can also refer to a protective outer covering for your own teeth. Crowns surround the entire tooth surface, providing additional strength and support and hiding cosmetic defects like deep discoloration or large fillings. A bridge is a dental device comprising a metal frame and one or more crowns and designed to span or “bridge” the gap made by one or more missing teeth. Bridges can be removable, attaching with clips to the teeth on either side of the gap, or permanent, using dental adhesive to attach them. They're a popular alternative to partial dentures.